Amy’s practice focuses on transactional work, including the establishment of 501(c)(3) not-for-profit organizations, estate planning and administration, and labor and employment related issues. 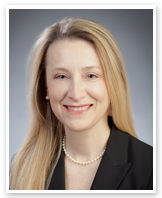 Amy is a member of the Ohio State Bar Association and the Columbus Bar Association. Amy is a graduate of Ohio Dominican University, class of 1999, with a degree in Political Science. She is a graduate of Capital University Law School, class of 2006, where she received the CALI Award of Excellence as Top Student in the General Practice Section. She is currently a member of the Ohio Dominican University Alumni Association Council. She is involved with the Humane Society of Delaware, a non-profit organization dedicated to helping abused, neglected and homeless pets find homes.